The Silver Screen Oasis is proud to announce that film historian J.B. Kaufman will be joining us on Saturday, November 21st and Sunday, November 22nd. Mr. Kaufman, is a writer and film historian who has also been one of the film scholars who has contributed to the ongoing Griffith Project, an international retrospective held by the Pordenone Silent Film Festival in Italy devoted to research into and distribution of the work of the pioneering film director, D. W. Griffith. The innovative filmmaker's legacy of some 500 films is being systematically documented and, when possible, restored through this project, allowing more of us to see and understand how much we have inherited from the earliest films. In addition to the Griffith Project, he writes about silent film at his website: http://www.jbkaufman.com. But he may be best known for his work on Walt Disney. A few years ago, J.B. was in the news as he introduced the Blu-Ray restoration of Snow White and the Seven Dwarfs (1937), commenting that the film "just looks spectacular" after the "dust-and-dirt removal as well as the brightening of the Technicolor picture to conform with the original intentions of Walt Disney's artists." Speaking about the restoration, Kaufman told the press that "As an historian and loving these films, one of my pet peeves is not being able to see them in a form that does justice to them -- and I think we're finally getting into a form that does." An examination of the complex cultural and political history of Walt Disney's cartoons set in Latin America as part of the Good Neighbor program initiated by Nelson Rockefeller during the early 1940s. As described by the publisher, the book begins "with the extraordinary research trip Disney undertook in 1941, leading a team comprising his top animators, artists, and writers from Mexico to Chile, renowned animation historian J. B. Kaufman reveals the story behind Disney's contribution to Rockefeller's program. 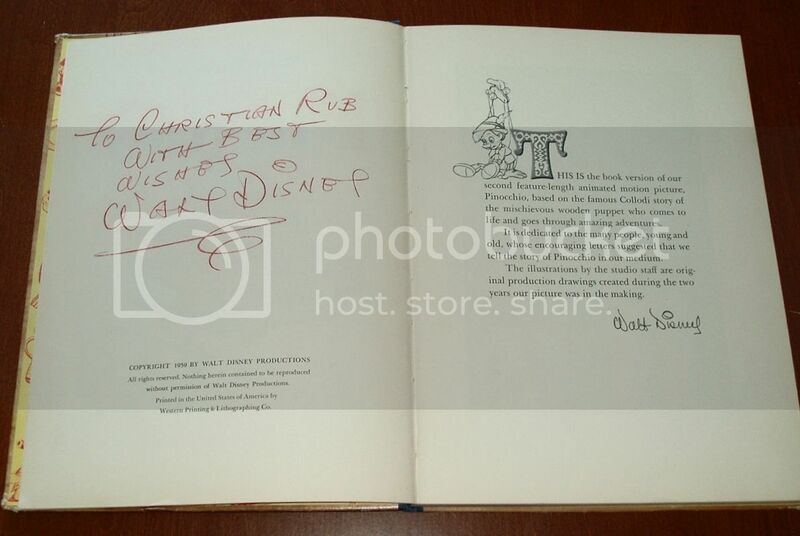 This examination of the early efforts of Disney to master his life work, was described by Linda Rosencrantz at The Miami Herald as an examination of the "whole fascinating 8-year period predating Mickey is chronicled in [this] meticulously researched book... The authors point out interesting links to the work of other animators (of such characters as Felix the Cat and Krazy Kat) and also demonstrate parallels to the routines of such silent clowns as Buster Keaton, Harold Lloyd, and Charlie Chaplin." As fellow film historian Leonard Maltin wrote when this book was released: "With perfect timing, Indiana University Press has taken on distribution of this valuable (and beautifully-printed) book, just as the second volume of Disney's Silly Symphonies cartoons has become available on DVD as part of my Walt Disney Treasures series. In truth, Merritt and Kaufman have been working on this definitive compendium for years... but it was well worth the wait...Every short is exhaustively chronicled, with information you will find nowhere else: when it went into production, who animated each individual shot, how much it cost to produce, where it debuted, and much, much more. No detail has gone unexplored...What's more, the book is beautifully designed and filled with rare illustrations in both black & white and color." Snow White: The Fairest One of All . Divided into three sections, the book traces the history of the “Snow White” tale in folklore, theater and film; records the making of the film in intimate detail; and follows with the film’s impact on the Disney studio and the world, immediately after its release and in the decades that followed. Based on years of archival research and interviews with the surviving filmmakers, this book traces the history of Pinocchio from the story’s roots in 19th-century Italy, through the Disney studio’s historic, painstaking efforts to produce the film, through the surprising events that followed the film’s release to a wartime world. He is also working with Disney on the release of a Silly Symphony music set that is in pre-order now and due to be released in the months ahead. The Silly Symphony Collection is a first-of-its-kind box set from Walt Disney Records and Fairfax Classics featuring the complete restored soundtracks from all 75 Silly Symphony shorts from 1929-1939, with more than 8 hours of music over 16 vinyl LPs. So please join us this weekend as JB takes questions about Walt Disney, Snow White, Pinocchio, the Silly Symphonies, South of the Border and silent film. JB will be joining us beginning Saturday morning but since he is in an earlier time zone than I am, I wanted to post my introduction and question today so as not to hold the train up. JB Kaufman, thank you so much for joining us! We really appreciate you taking the time to join us and talk about your work! Your latest book is on the making of Pinocchio and I was wondering what you liked best about researching the book? Also, what, if anything, did you uncover in your research that wasn't widely known? And, how did you get interested in the life and early work of Walt Disney! Remember, JB will be here in the morning to hopefully answer these questions and yours! Good morning! And thank you, Lynn, for your kind words and your questions, and may I say that it's a real pleasure to be virtually visiting you and the rest of the Oasis this weekend. To answer your questions: I think what I enjoyed most about researching Pinocchio was that there was so much unexplored territory. That's a paradox, since the film itself is so widely known and loved, but for some reason it's been far less documented than its predecessor Snow White or its immediate successor Fantasia. So I got to delve into a lot of aspects that were relatively untouched. And that segues into your next question: there was a LOT that wasn't widely known. I think chief among those unknowns was the tremendous amount of story material that was suggested, considered, in some cases extensively developed, and then dropped before the film was finished. Those abandoned sequences are always fascinating, and there were several of them in Snow White, but it turns out there were a LOT more of them in Pinocchio. One of the most interesting ones depicted Geppetto and Figaro, starving in the belly of the whale, starting to obsess on the idea of eating Cleo the goldfish! That idea progressed so far that animation had actually started before the idea was dropped. As far as how I got interested in Walt Disney ... we've only got one weekend to talk about this! Basically, I discovered Disney movies at an early age (as I think a lot of us do), and was utterly fascinated with them and wanted to know more about them. After that, one thing led to another. That was a few years ago, but the wish to know more about them is still as strong as ever. Thanks! Can you talk a bit about the evolution of Jiminy Cricket? He is the ultimate sidekick but how did he come about? Thanks, Lynn. Yes, Jiminy Cricket evolved over time. You may know that Collodi's original novel had a Talking Cricket who admonished Pinocchio to be a good boy and obey his father, and that Pinocchio's response was to throw a hammer at the Cricket and smash him against the wall! (That didn't keep the Cricket from showing up again in later chapters, but he remained a minor character in the story.) The Disney writers did start with this original character -- almost everything in the Disney film is based, however loosely, on something in the Collodi original -- and they did set out to develop him for the film story, but initially they, too, were thinking of him as a minor character. After that his role gradually expanded, and it was a natural step to cast him as Pinocchio's conscience. Then, after a long period of story development, someone suggested that he could actually be the narrator of the story -- which expanded his role still further. Finally, after all that evolution, Walt came up with the idea of having the Cricket appear at the beginning and introduce the story as a framing device. (That's not just PR; we know it was Walt's idea because we have the transcript of the story conference.) The net effect of all those changes was to make the Cricket a major character who really carries a lot of the story. His name, Jiminy Cricket, was a little joke; in the late 1930s "Jiminy Crickets!" was a popular expression that served as a sort of harmless expletive (although, today, I think most of us hear those words and automatically picture the Disney character). As for his appearance, Ward Kimball, the principal artist who animated the character, claimed that he started with a more insect-like design, then gradually eliminated the insect details ("the cockroach syndrome," he called it) at Walt's direction. In the end he wound up with the "little man" design that is still familiar today. Walt Disney was a master at promoting his upcoming projects, and there are some sublte hints in Pinnochio that herald Disney projects and have references that allude to classic literature and other classic films. What are some of your discoveries that we might not know about? Thanks for joining us, J.B.! 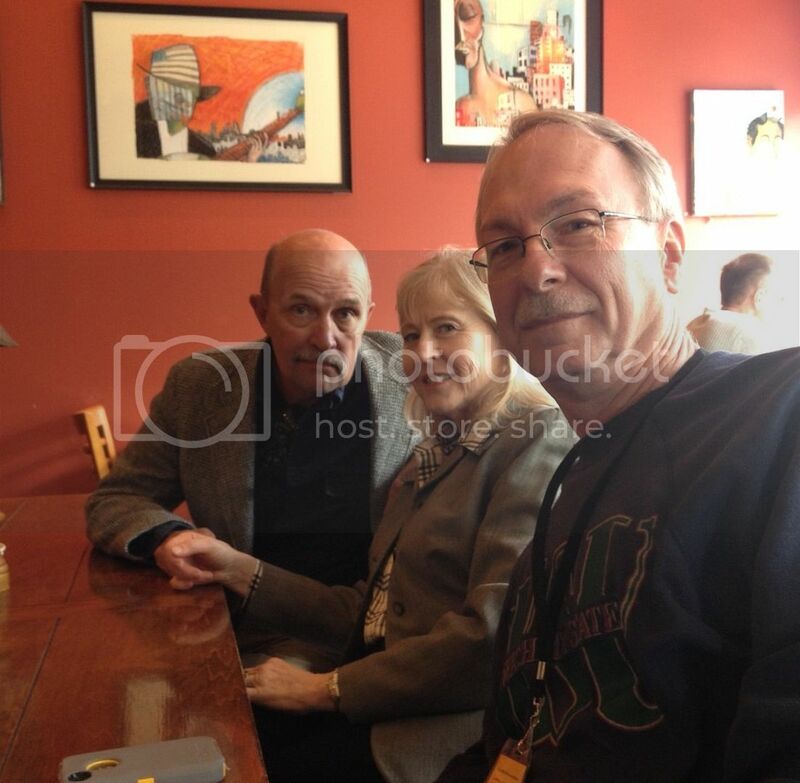 It was wonderful to lunch with you at the Firewood Grill with friends Paula, Michael, Sheryl, Joe, Tracy and James during the San Francisco Silent Film Festival 2015! I thoroughly enjoyed your book promo, by the way! Thank you, Christy. It was great to see you, too, and our other mutual friends at SFSFF. That's one of my favorite festivals, and it just keeps getting better. That's the closest Pinocchio comes to explicitly promoting future Disney films on screen. But in the intensely creative atmosphere of the studio at that time, some discoveries and innovations from Pinocchio inevitably had a bearing on other films in development. For example ... I mentioned a while ago the great number of story threads that were developed for the film, then dropped before completion. One of them was the "Grandfather Tree" sequence, in which Geppetto was to tell Pinocchio the story of the pine tree that was one of his ancestors. Among other things, the sequence was going to include a forest fire, and the effects department developed some very striking visual effects to depict the fire on the screen. Of course the "Grandfather Tree" didn't make it into the finished film, so those techniques weren't immediately used -- but they were used to great effect a couple of years later in the forest-fire sequence in Bambi. 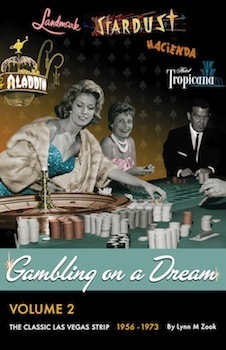 As for allusions to classic literature and films, the Disney staff was immersed in all kinds of cultural influences and those influences invariably were reflected in their films. One little example: when they began to develop Jiminy Cricket, one obvious literary forerunner that came to mind was Dickens' "The Cricket on the Hearth." That story didn't have a great bearing on Pinocchio so the writers didn't make much of it; but they did carefully insert a line in the opening sequence: "Of course I'm just a cricket, singing my way from hearth to hearth ..."
Now that the Pinocchio book is available, what's next for you? What other projects are you working on? Is this a photo of Christian Rub who voiced Geppetto next to the on-screen Geppetto? Is it true the animators used his likeness? Are there any more unknown inspirations? Sue Sue Applegate wrote: Is this a photo of Christian Rub who voiced Geppetto next to the on-screen Geppetto? Is it true the animators used his likeness? 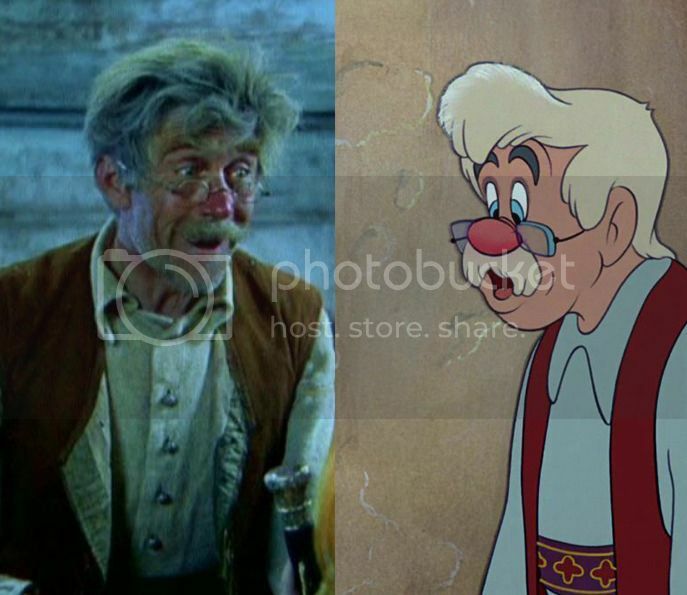 Yes, that's Christian Rub who provided both the voice and the likeness of Geppetto. He and some of the other voice talents were actually filmed in live-action, performing their scenes in the film -- not for rotoscoping purposes, but just so they animators could study their movement and possibly pick up gestures or mannerisms that might be useful in animating the character. Before the studio cast Rub as the voice of Geppetto, Spencer Charters (familiar, I'm sure, to many Oasis visitors as a beloved character player) was tentatively cast in the role -- and for a time, Geppetto looked a lot like Spencer Charters! Wow! I knew you would have some interesting backstories. Thanks, J.B.! Lzcutter wrote: Now that the Pinocchio book is available, what's next for you? What other projects are you working on? Apart from that, I've started research for a new book on Dumbo! I'm excited about that too -- the film is such a classic, and very different from either Snow White or Pinocchio. And I'm also collaborating with Maggie Barnes on a biography of her grandfather, Clarence Nash, the original voice of Donald Duck. It's really Maggie's book, but I'm really honored that she invited me to collaborate. We've all grown up with that voice, but now I'm learning something about the man behind it, and he turns out to be a wonderful character -- a very down-to-earth, gentle man, utterly unlike his short-tempered alter ego! And there are other Disney projects waiting in the wings too ... along with some non-Disney ones. I've always loved silent film and, more years ago than I like to admit, I met Blanche Sweet and started working on a book about her career. I've done a lot of work on that project, off and on, over the years, but it's been on the back burner for quite a while. Now I'm taking active steps to get going on it again and finish it this time! Thanks very much for stopping by again, J.B. In discussing the evolution of Jiminy Cricket as a character in Pinocchio (1940), could you please touch on how the choice of veteran singer/actor Cliff Edwards as the animated character's voice was made? Was Edwards surprised to be cast? Was it difficult for him to meet the needs of the filmmakers as the narrator? 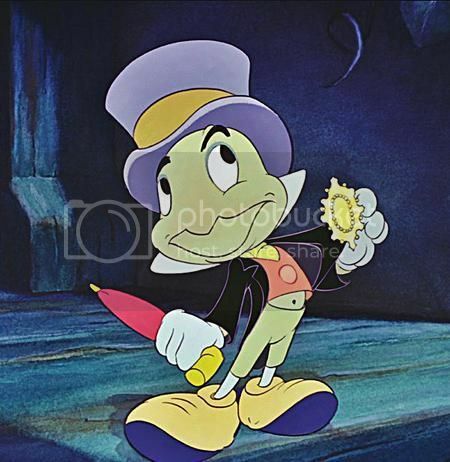 Was the look of the animated Jiminy influenced by Edwards' appearance? How did working for Disney affect the rest of the entertainer's career? Were the words and music by Ned Washington & Leigh Harline written with Edwards' uniquely touching, wistful jazz-baby-with-the-blues style in mind? I will post more questions soon! Thanks in advance for your responses. 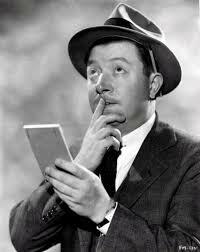 Hi, Moira, and thank you for your Cliff Edwards questions. The primary documents are a little sketchy on why Edwards was cast as the Cricket's voice, but of course Walt and the artists would have been very familiar with him as a character actor and as a voice -- testing him for the role was in line with what they had done on Snow White, testing well-known radio comics (and casting some of them) as voices of the Seven Dwarfs. In any case, Edwards wasn't originally part of Walt's concept for the film. 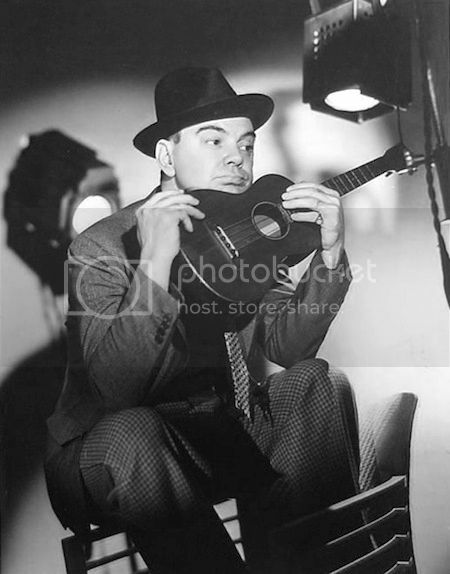 Cutting records seem to indicate that he wasn't tested for the role until the summer of 1938, well into production. Earliest plans for the Cricket depicted him as a different kind of character, a sober-minded, preachy little guy along the lines of Collodi's original Talking Cricket. In an interview after the film was released, Walt talked about that earlier version of the character and added: "As it turned out, Cliff was somewhat responsible for changing Jiminy’s character. Cliff’s voice had so much life and fun in it that we altered the character to conform with the voice." Even after Edwards was cast in the role, he wasn't pictured as the film's narrator until some months afterward. When that change was made in the story, the crew made test recordings of Edwards as narrator, and of course he handled it very well. In fact, they wrote and recorded much more extensive narration for him than we hear in the finished film, underscoring various episodes all the way through the story. In the final version, he narrates only the opening sequence. I don't know whether Washington and Harline had Edwards' voice in mind when they wrote "When You Wish Upon a Star," but it's entirely possible. The song was originally written just to go along with Geppetto's wish on a star after he had carved and painted Pinocchio. Everyone liked the song, but apparently it was some time before they could figure out how to use it. Edwards made a test recording at the time, evidently just because it was a great song and he was a well-known singer -- but the Cricket was still such a minor character at that time that there was no reason in the story for him to sing it! When the decision was made to use the Cricket as the narrator, and to have him introduce the story at the opening, Edwards' performance of the song fell beautifully into place -- one of the many serendipitous ideas that ultimately made Pinocchio such a classic. No, Edwards' appearance didn't influence that of the Cricket. When the crew filmed live-action reference footage of the Cricket, they used not Edwards but another actor, with more of a spry, nimble carriage, named Val Stanton. And in fact, for some of the Cricket's high jumps they used an athletically inclined studio cutter named Dave Lurie. As for Edwards himself, he was apparently a little bemused when first invited to test for the role, but by the end of production he was telling interviewers that he couldn't wait to work for Disney again. And of course he did, many times -- and apparently was in such financial straits, at that time in his career, that the long-term Disney connection was, literally, a life-saver.